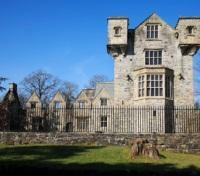 Stay in historical castles and manor houses as you are driven around Northern Ireland with an expert guide. Visit the Giant’s Causeway, the revitalized city of Belfast, picturesque Donegal and cultural Galway, as well as stunning coastline, mountains, lakes & historical sites. 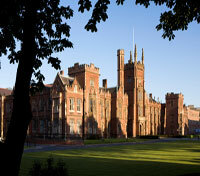 Experience the beauty, history and culture of Northern Ireland as you travel throughout this magical, mythical land. 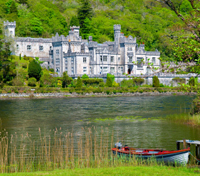 Stay in historical castles that could be taken from a fairytale and see all of the sights – from picturesque towns and villages, to stunning coastlines including the UNESCO site of the Giant’s Causeway, the pre-historic monument of Newgrange which pre-dates the Pyramids, iron age forts and spectacular mountains and lakes (to name but a few of the highlights). In the company of a knowledgeable Irish driver-guide, you will have the flexibility of spending each day at your own pace, and visiting places that are of particular interest to you. All of our driver guides are experts on the areas you will be visiting on your tour of Ireland. 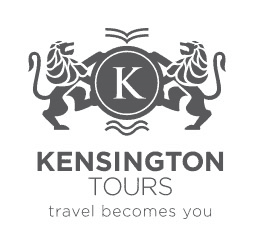 We bring experienced driving skills, expert touring routes as well as knowledge and insight into the places you will be visiting and staying on your tour. Our driver guides will also recommend places to shop, have a drink, and dine in the various towns and villages and cities of Ireland. Your driver guide can arrange all kinds of activities, events and generally show you Ireland in such depth and quality that is only possible using a local expert. – Simply the best and most enjoyable way of seeing the Emerald Isle, in style! In order to give as much flexibility as possible, we have not included entrance fees and these can be paid in person on site. After you are met by your Driver-Guide in Dublin airport, you will be brought for a full day of sightseeing on your way to Belfast. Newgrange is quite simply one of the great wonders of western ancient civilization that need to be seen close up to be fully appreciated. Dating from before the Pyramids it is a complex chamber that is perfectly aligned to catch the morning sun on the winter solstice. There are two other major tombs at Knowth and Dowth, both equally impressive and different in character. Nearby is the River Boyne where the famous Battle of the Boyne took place. The land here is lush and full of ancient and medieval ruins that are testaments to Irelands great heritage. 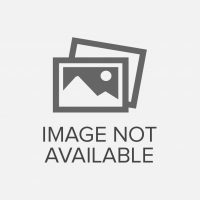 Because you have the flexibility of your own private vehicle with driver-guide, you can spend as much or as little time at the various places of interest en route to Belfast. This afternoon, you’ll be driven through County Down which is arguably, Northern Irelands most scenic mountainous region that has been immortalized in the songs of Percy French and in ancient folklore. Downpatrick is an ancient town with The Fort of Patrick, a hill on which Down Cathedral is placed and reputed to be the final resting place of St Patrick, Ireland’s patron Saint. A large granite boulder marks his tomb and this is a place of pilgrimage on Ireland’s national holiday. Newcastle is famous for sweeping long beaches and a golf course. Nearby the famed Tollymore Forest park is green and enchanting. The picturesque village of Rostrevor has a history of ancient kings and buried giants and is a beautiful point in which to explore more of Carlingford Lough. Upon arrival into Belfast, you’ll have time to relax and unwind as you settle into your surroundings before thinking of dinner plans for this evening. Belfast City is among the most fascinating places in the world to visit due to the evolving political and cultural shifts taking place weekly. The oldest quarter in the city is the Cathedral Quarter. It is located closest to the waterfront and dominated by the beautiful Church of Ireland Cathedral, St Anne’s. 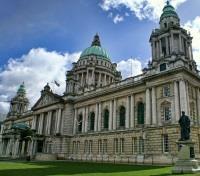 It was here that Belfast grew from an obscure village to become the vibrant city that it is today. In the city centre Donegal Place is one of Europe’s finest squares and many buildings from Belfast glory days as the second city of the British Empire remains such as the Opera House, Town Hall and The magnificent Queens University. On the edge of the city are the great attractions at The Ulster Folk Park and Ulster Transport Museum. The waterfront was the engine of the extraordinary wealth and industry that saw Belfast transformed from a small town to a mighty city of over 450,000 people by the beginning of the 20th century. The Titanic was designed and built in Belfast between 1909 and 1912 and sent proudly out on her maiden voyage. When RMS Titanic sailed away from Belfast on her maiden voyage on April 10th, 1912, she was hailed as ‘the new wonder of the world’. A remarkable feat of Edwardian engineering and craftsmanship, she was the largest and most luxuriously appointed ship ever seen, and despite her tragic sinking she remains a source of enduring pride in the city where she was built – Belfast. Among Ireland’s most unforgettable beauty spots is the Causeway Coast that stretches from Belfast to Derry along the North Eastern region the Island. Enjoy the spectauclar coastal seascapes on your chauffeur driven drive from Belfast to Donegal town, stopping off at various places throughout the day. Soon we enter the Nine Glens of Antrim as they drop majestically from the Antrim Plateau to the ocean below. Touring the northernmost coast will encompass the beautiful highlights of this unique coast that includes The Distillery at Bushmills, Dunluce Castle and Carrick A Rede Rope Bridge as it hangs precariously over the North Atlantic Ocean. A stop for food or a drink at the historic 16th century Bushmills Inn in Bushmills is also a highlight. The Giants Causeway is a UNESCO World Heritage site rated as one of the Natural Wonders of the World. It is made up of 40000 interlocking basalt columns up to 12 metres long that stretch along the coast and into the ocean. You’ll spend the day today in the company of your driver-guide who will show you the sights in the area. Derry City is the second city of Northern Ireland and one of the finest walled cities in the country. It has a large town feel and is dominated by the River Foyle that sweeps through the town. The walls are a historic reminder of the troubles and murals, watchtowers and ramparts are interesting to visit. Around the city is the Ulster American Folk Park, an open-air museum which explores the historical link between Ulster and America, focusing particularly on the lifestyle and experiences of those immigrants who sailed from Ulster to America in the 18th and 19th centuries. Enjoy the afternoon exploring the beautiful Northern coastline. The Inisowen Peninsula (and specifically Malin head) is Irelands’ highest point and there are areas of unspoilt and natural beaches with lagoons and raging surf. Lough Swilly to the left and Lough Foyle to the right shape the landscape of this unique peninsula. There are numerous pretty seaside and country towns and villages full of rustic charm including Ballyliffin, Moville and Muff. The highlights of the peninsula tour include Greencastle built by Richard de Burgo in 1305, and the Martello Tower and Fort built in 1805 and 1811 to prevent the possible invasion by Napoleon through this strategic inlet. On the edge of the peninsula is Grianan of Aileach, an Iron Age Fort built by the ancient rulers of Ireland which is still one of the most impressive vernacular structures in Ireland. Transfer from Donegal to Galway via Sligo in the company of your driver guide in a private vehicle. Sligo is an area of extreme beauty and varied landscapes with ancient sights dotted along its coast and mountains. South of the city is Carrowkeel, a five thousand year old megalithic cemetery which is hidden amongst the clambering hills. Ben Bulben is a beautiful Table Mountain where Ireland’s greatest poet WB Yeats is laid to rest at Drumcliff where his gravestone with its enigmatic epitaph can be meditated upon. Also in the region are beautiful lakes, mystical Islands and pure waterfalls that inspired Yeats with romantic visions. 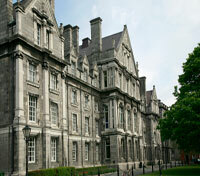 Galway is Irelands Gaelic language cultural and arts Capital. The city centre is famous for its lively ambience, street entertainment and wonderful shops, cafes and pubs. As the centre of the city is pedestrian this is best explored at leisure and taking the axis from Eyre Square through Shop Street, Quay Street and down to Claddagh Quay. For shopping we recommend Fallers of Galway, Kenny’s Book & Art Store and the myriad of Claddagh Jewellery stores. The Latin Quarter is veritably buzzing from the eclectic legacy of a maritime past with the Spanish Arch and cobbled street fronts. Dining and pubs numerous and the Quays Bar, Naughton’s Pub and Mc Donaghs for fresh fish and chips are all favorites. A complimentary, shared shuttle service will transfer you between your nearby airport hotel and Dublin International Airport.